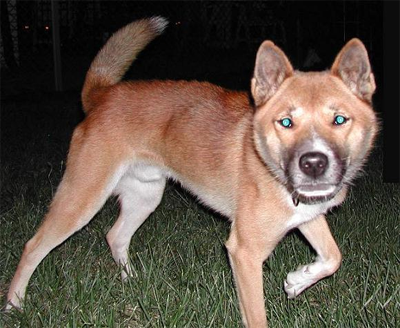 Compared to other species of the genus Canis, the New Guinea Singing Dog is described as relatively short-legged and broad-headed. These dogs have an average shoulder height of 13 - 16 inches (31 - 46 cm) and weigh 17 - 25 pounds (9 - 14 kg). They do not have rear dewclaws. 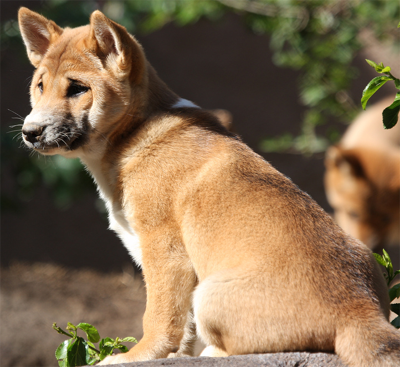 New Guinea Singing Dogs have erect, pointed, fur-lined ears. As with other wild dogs, the ears perk or lay forward. Singer tails should be bushy, long enough to reach the hock, free of kinks, and have a white tip. Pups are born with a dark chocolate brown pelt with gold flecks and reddish tinges, which changes to light brown by the age of six weeks. Adult coloration occurs around four months of age. For adult dogs in the wild, the colors brown, black and tan or black have been reported, all with white points. For dogs in captivity, the colors brown, black with tan on the snout, legs and belly and dark (brown with a strong upper layer of dark-tipped guard hair) have been verified. Brown colored variants include: light brown, reddish-brown or reddish-yellow with lighter shades on the belly, inner surface of the legs and the ventral brush of the tail. The sides of the neck and zonal stripes behind the scapula are golden. Black and very dark guard hair is generally lightly allocated over the hair of the spine, concentrating on the back of the ears and the surface of the tail over the white tip. The muzzle is always black on young individuals. Generally, all colors have white markings underneath the chin, on the paws, chest and tail tip. About one third also have white markings on the muzzle, face and neck. Brindled individuals have not been observed. By 7 years, the black muzzle begins to turn gray. The eyes, which are highly reflective, are almond-shaped and are angled upwards from the inner to outer corners with dark eye rims. Eye color ranges from dark amber to dark-brown. Their eyes glow bright green when bright lights are shined in at them in low light conditions. Researchers believe there are two reasons for the bright reflective glow; not only do the pupils open wider and allow in more light than in other dog breeds, there is also a higher concentration of cells in the tapetum. 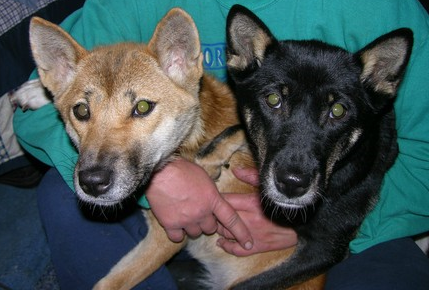 These two features allow singing dogs to see more clearly in low light, a trait which is unusual in canids. The New Guinea Singing Dog has a distinctive and melodious howl, which is characterized by a sharp increase in pitch at the start and very high frequencies at the end. An individual howl lasts for 0.5-5 seconds (3 seconds on average). A trill, with a distinctly "bird-like" character, is emitted during high arousal. It is a high-frequency pulsed signal whose spectral appearance suggests a continuous source that is periodically interrupted, and might last as long as 800 milliseconds. 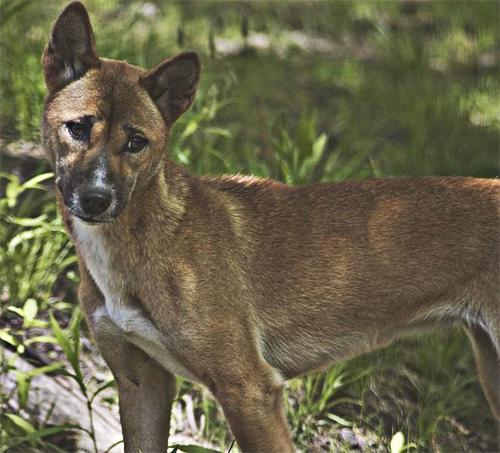 Although little is known about the New Guinea Singing Dog in the wild, one can surmise from their aggressive interactions with domestic dogs that they are a highly territorial species, although they do not form large packs as most other canines. Most sightings in the wild have been of single dogs or pairs of dogs; they are not known to roam in large groups. Head Toss -- This behavior, shown by every observed dog, is a prompt for attention, food or a sign of frustration, expressed in varying degrees depending on the level of arousal. In the complete expression, the head is swept to one side, nose rotated through a 90° arc to midline, then rapidly returned to the starting position. The entire sequence takes 1–2 seconds. The mildest expression is a slight flick of the head to the side and back. During this behavior, the characteristic contrasting black and white chin markings are displayed. Copulatory scream: At the copulatory tie, the female emits a repetitive sequence of loud, high-pitched yelps lasting about 3 minutes. This scream has a strong arousal effect on most domestic dogs within auditory range. Female NGSDs come into heat once per year; their breeding season is from August to December, and is otherwise similar to that of the gray wolf as far as gestation and litter size. Singers are unique in that females may undergo estrous multiple times in a year if they are unsuccessful in conceiving a litter the first time. Although males are permitted to assist in raising puppies, females are protective of their young and will become aggressive toward the male if they feel he is a danger to the puppies. Pups are typically driven away by their parents during the start of the next years' breeding season, and are not permitted to remain to raise the next years' children. These canines are found in the mountains and swampy mountain regions of Papua New Guinea. They prefer mixed forest, beech and moss forest, sub-alpine coniferous forest, and alpine grasslands. One can assume they have moved to retake much of the island since the destruction of humanity. Singers typically prey on small rodents or mid-sized marsupials; they do not tend to take after larger ungulate prey. 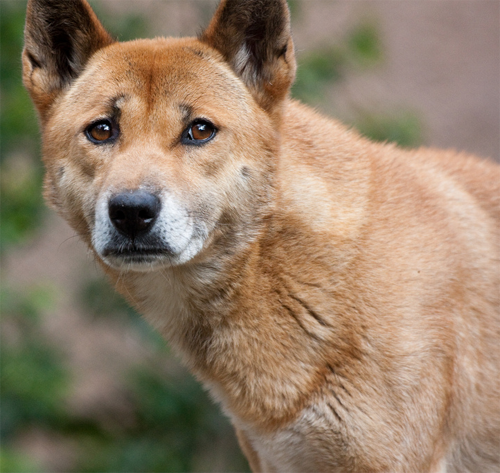 New Guinea Singing Dogs were extremely rare throughout the 1970s and 1980s; there were rumors that it was even extinct, as no sightings of wild dogs were made during this time. However, remote populations did survive, and upon the destruction of humanity, they once again flourished. 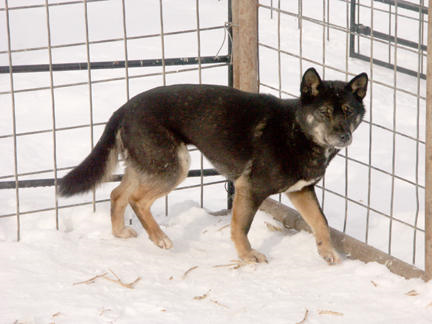 New Guinea Singing Dogs are a mix of feral and Luperci populations -- there are many pockets of isolated non-Luperci canines throughout the area. Most of the Luperci traits brought into the area were from wild dogs, jackals, and wolves exploring from Eurasia. Few dogs tend to take on human lifestyles even if they are Luperci.